Is the Rule of Thirds Right for 2.39:1? 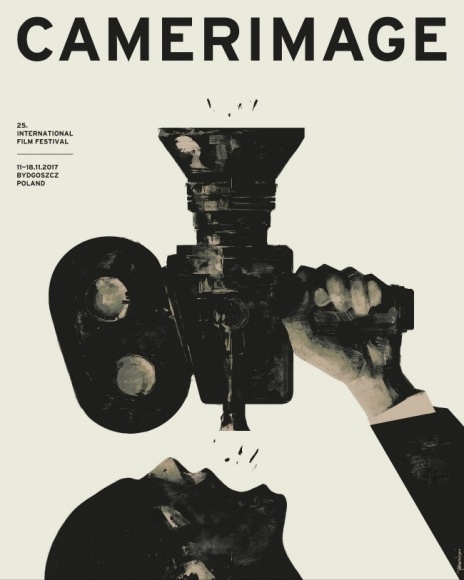 This is the third and final part of my report from my time at Camerimage, the Polish film festival focused on cinematography. Read part one here and part two here. I thought I would be one of the few people who would be bothered to get up and into town for this technical 10:15am seminar. But to the surprise of both myself and the organisers, the auditorium of the MCK Orzeł was once again packed – though I’d learnt to arrive in plenty of time to grab a ticket. Up.grade is an international colour grading training programme. Their seminar was divided into two distinct halves: the first was a fascinating explanation of how human beings perceive colour, by Professor Andrew Stockman; the second was a basic overview of colour pipelines. Our eyes record very little colour information compared with luminance info. You can blur the chrominance channel of an image considerably without seeing much difference; not so with the luminance channel. Light hitting a rod or cone (sensor cells in our retinae) straightens the twist in the carbon double bond of a molecule. It’s a binary (on/off) response and it’s the same response for any frequency of light. It’s just that red, green and blue cones have different probabilities of absorbing different frequencies. There are no blue cones in the centre of the fovea (the part of the retina responsible for detailed vision) because blue wavelengths would be out of focus due to the terrible chromatic aberration of our eyes’ lenses. Data from the rods and cones is compressed in the retina to fit the bandwidth which the optical nerve can handle. Our perception of colour changes according to its surroundings and the apparent colour of the lighting – a phenomenon perfectly demonstrated by the infamous white-gold/blue-black dress. All in all, very interesting and well worth getting out of bed for! At the end of the seminar I caught up with fellow DP Laura Howie, and her friend Ben, over coffee and cake. Then I sauntered leisurely to the Opera Nova and navigated the labyrinthine route to the first-floor lecture theatre, where I registered for the imminent Arri seminar. After picking up my complementary Arri torch, which was inexplicably disguised as a pen, I bumped into Chris Bouchard. Neither of us held high hopes that the Support Programme would be relevant to us, but we thought it was worth getting the lowdown just in case. 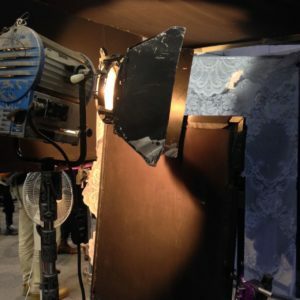 The Arri International Support Programme (ISP) is a worldwide scheme to provide emerging filmmakers with sponsored camera/lighting/grip equipment, postproduction services, and in some cases co-production or sales deals as well. Mandy Rahn, the programme’s leader, explained that it supports young people (though there is no strict age limit) making their first, second or third feature in the $500,000-$5,000,000 budget range. They support both drama and documentary, but not short-form projects, which ruled out any hopes I might have had that it could be useful for Ren: The Girl with the Mark. Having noted these keys details, Chris and I decided to duck out and head elsewhere. While Chris checked out some cameras on the Canon stand, I had a little chat with the reps from American Cinematographer about some possible coverage of The Little Mermaid. We then popped over to the MCK and caught part of a Canon seminar, including a screening of the short documentary Kolkata. Shortly we were treading the familiar path back to the Opera Nova and the first-floor lecture theatre for a Kodak-sponsored session with Ed Lachman, ASC, only to find it had been cancelled for reasons unknown. Next on our radar was a Red panel. I wasn’t entirely sure if I could handle another high resolution seminar, but I suggested we return once more to the MCK anyway and relax in the bar with one eye on the live video feed. Unfortunately we got there to find that the monitors had disappeared, so we had to go into the auditorium, where it was standing room only. Light Iron colourist Ian Vertovec was talking about his experience grading the Netflix series GLOW, a highly enjoyable comedy-drama set behind the scenes of an eighties female wrestling show. Netflix wanted the series delivered in high dynamic range (HDR) and wide colour gamut (WCG), of a spec so high that no screens are yet capable of displaying it. In fact Vertovec graded in P3 (the colour space used for cinema projection) which was then mapped to Netflix’s higher specs for delivery. The Rec.709 (standard gamut) version was automatically created from the P3 grade by Dolby Vision software which analysed the episodes frame by frame. Netflix streams a 4,000 NIT signal to all viewers, which is then down-converted live (using XML data also generated by the Dolby Vision software) to 100, 650 or 1,000 NITs depending on their display. In theory this should provide a consistent image across all screens. Vertovec demonstrated his image pipeline for GLOW: multi-layer base grade, halation pass, custom film LUT, blur/sharp pass, grain pass. The aim was to get the look of telecined film. The halation pass involved making a copy of the image, keying out all but the highlights, blurring those highlights and layering them back on top of the original footage. I used to do a similar thing to soften Mini-DV footage back in the day! An interesting point was made about practicals in HDR. If you have an actor in front of or close to a practical lamp in frame, it’s a delicate balancing act to get them bright enough to look real, yet not so bright that it hurts your eyes to look at the actor with a dazzling lamp next to them. When practicals are further away from your cast they can be brighter because your eye will naturally track around them as in real life. Next up was Dan Duran from Red, who explained a new LUT that is being rolled out across their cameras. Most of this went in one ear and out the other! Afterwards, Chris and I returned to Kung Fusion for another delicious dinner. The final event of the day which I wanted to catch was Breaking Bad‘s pilot episode, screening at Bydgoszcz’s Vue multiplex as part of the festival’s John Toll retrospective. Having binged the entire series relatively recently, I loved seeing the very first episode again – especially on the big screen – with the fore-knowledge of where the characters would end up. Later Chris introduced me to DP Sebastian Cort, and the three of us decided to try our luck at getting into the Panavision party. We snuck around the back of the venue and into one of the peripheral buildings, only to be immediately collared by a bouncer and sent packing! 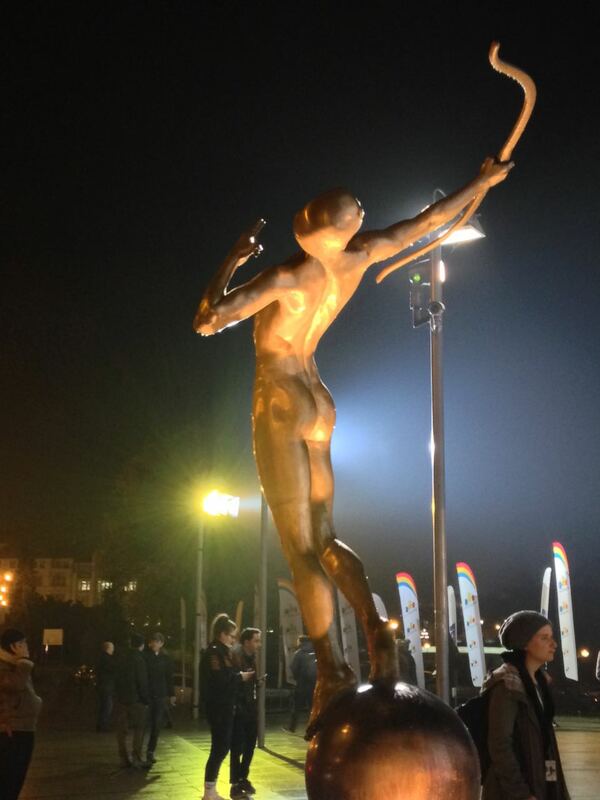 This ignoble failure marked the end of my Camerimage experience, more or less. After another drink or two at Cheat we called it a night, and I was on an early flight back to Stansted the next morning. I met some interesting people and learnt a lot from the seminars. There were some complaints that the festival was over-subscribed, and indeed – as I have described – you had to be quick off the mark to get into certain events, but that was pretty much what I had been expecting. I certainly won’t put be off attending again in the future. Defining the Look: How Can Cinematographers Keep Control of the Look of their Films? 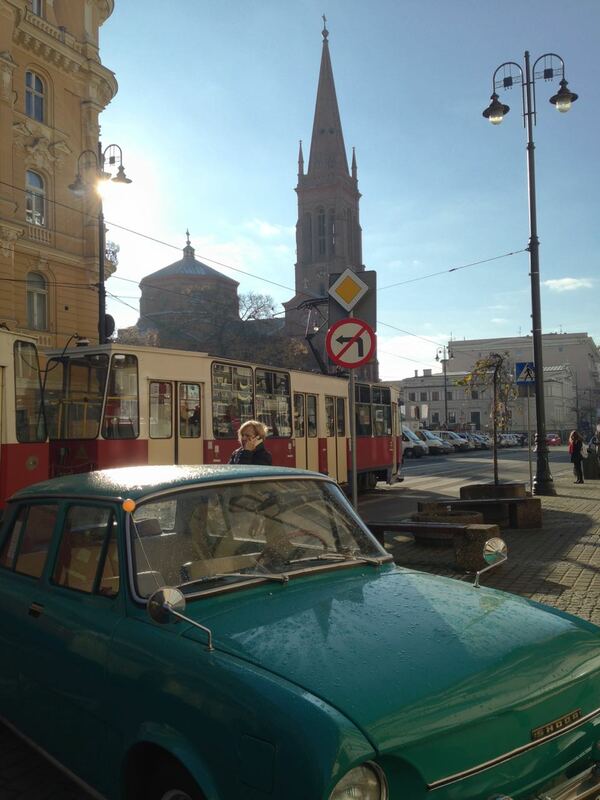 This is the second part of my report from my time at Camerimage, the Polish film festival focused on cinematography. Read part one here. It was a chilly but bright morning as I strolled into Bydgoszcz and made straight for the MCK Orzeł, where I planned to spend most of the day. With only a few minutes to go until the scheduled start time, the queue for Panavision’s large format seminar had spilt out onto the street. The tickets ran out before I reached the desk, but there was a live video feed in the cinema’s bar. In many ways this was better than going into the auditorium – sitting in a comfy chair with the bar close at hand, and a table to make notes on. My article for Red Shark News about the future of large format cinematography has been surprisingly popular, and it contains plenty of detail about this Panavision seminar, so I won’t repeated myself here. I will say that it converted me from a high resolution sceptic to a believer, because the speakers demonstrated that footage acquired in high rez – even when downscaled – retain much of its smoothness, high bit depth and dynamic range. “More resolution evokes the imagination of the brain,” was how colourist Ian Vertovec summed it up. At the end of the session, Red Shark’s David Shapton and Matt Gregory emerged from the auditorium and joined me for lunch at the bar. We had all found the seminar very interesting, and Matt was quick to get us all tickets to the Panasonic 4K seminar coming up later in the day. The pair then went off to other things, while I headed to the kiosk to get a ticket for the imminent John Toll seminar. But of course I’d left it too late, they were all gone, and so I returned to my comfy chair in the bar to watch via video feed again. John Toll, ASC was the recipient of this year’s Lifetime Achievement Award at Camerimage, and this seminar was an epic journey through this career. 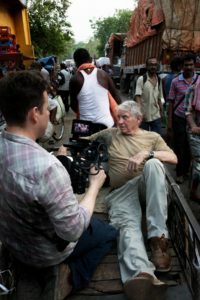 He explained how he learnt his craft as a camera operator for the late great Conrad Hall, ASC and Jordan Cronenweth, ASC. The talk then focused on some of Toll’s biggest movies, beginning with the period drama Legends of the Fall starring Brad Pitt and Anthony Hopkins. 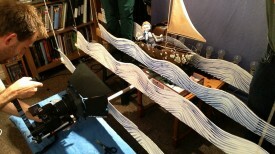 The movie was largely daylight exterior (something that was to become a theme across Toll’s work) so the cinematographer insisted on twelve weeks of prep, the same as the production designer. This allowed him to be part of selecting locations and choosing orientations for the buildings to get the optimal sun path. Toll said he was lucky that the 1st AD was willing to be flexible with the schedule, observing the mood of the weather each day and shooting scenes that matched that mood. Gaffer Jim Plannette joined Toll on the stage to discuss the huge night exterior battle sequence. This employed three Musco lights (a Musco being fifteen 6K pars on a 100ft boom arm) which three-quarter-backlit every angle. To get crisp, grain-free blacks, Toll overexposed and printed down. Braveheart was covered next, with 1st AC Graham Hall joining the panel. Hall had a difficult time with the film’s battle scenes, featuring as they did so much movement, improv and slo-mo. Toll revealed how the immersive style of the action was based on a sixties TV documentary about Culloden that coincidentally both he and director Mel Gibson had seen. A lot of colour timing was required to give consistency to the battles, which were shot over weeks, at all times of day. The discussion then turned to Terrence Malick’s The Thin Red Line. The Australian locations featured very difficult, uneven terrain, so Toll used an Akela Crane. The crane’s arm was so long (75ft) that the arc of its movement couldn’t be detected on camera. Its use had to be carefully planned though, because each time it needed to be moved it had to be disassembled and reassembled on a special platform. 80% of the film was actually handheld, and Toll operated himself so as to respond to the spontaneity and improv which Malick encourage from his cast. Toll told a funny story about a shot of shadows moving across long grass which was praised by critics. It was inserted to cover a continuity error, the build-up to the battle having been shot in heavy cloud, while the battle itself was shot in full sun. A happy accident! Time was running short, so the moderator powered through Almost Famous (where parallels were drawn between the explosive battle scenes of Toll’s earlier movies and the crowd scenes at the rock concerts, punctuated by flashing cameras), Vanilla Sky and Billy Lynn’s Long Halftime Walk. This latter film, directed by Ang Lee, is notable for its acquisition in 120fps 4K stereo. 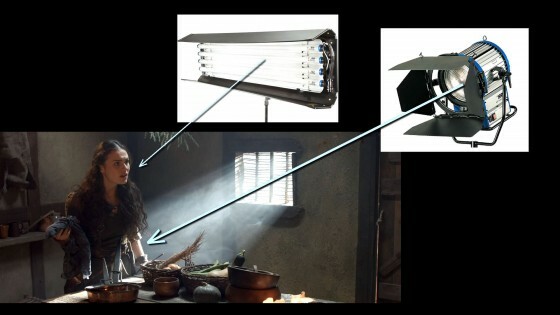 You can read more about it on the British Cinematographer website. I remained at the MCK and, meeting up with Dave and Matt again, finally got into the auditorium, for the Panasonic seminar. Moderated by British Cinematographer‘s Ronnie Prince, the panel brought together a trio of DPs who shoot Netflix shows on the Varicam: Bobby Shore, CSC (Anne with an E), Pepe Avila del Pino (Ozark) and Patrick Alexander Stewart (Arrested Development). 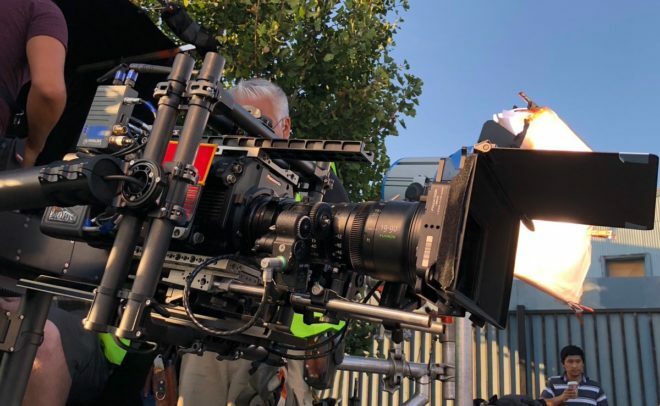 Both Shore and del Pino admitted that they were most comfortable with the Arri Alexa, but due to Netflix’s strict rules on 4K acquisition (the Alexa tops out at 3.2K) they had to find another camera. 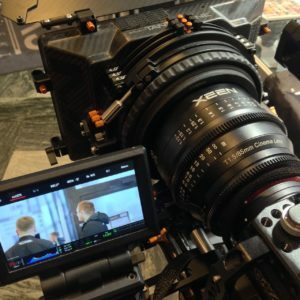 They plumped for the Panasonic Varicam, a 4K camera best known for having dual native ISOs: 800, in common with the Alexa, Red and many others, and 5000, two and two-thirds stops faster. Being native, both ISOs have the same dynamic range, the same log curve and in theory are equally clean. Panasonic, I think, were keen to push ISO 5000 in this seminar, but unfortunately Shore and del Pino shot almost exclusively at 800. Stewart did shoot Arrested Development at 5000, interiors and night scenes at least, but down-rated it to 2500. Otherwise, he said, the sets would have been too dark for the actors to feel like they were in a believable daytime environment. I think that’s a fascinating, unexpected side effect of low light sensitivity! Stewart lit the stages with large Quasar softboxes and paired the Varicam with Fujinon zooms and occasional Xeen primes. 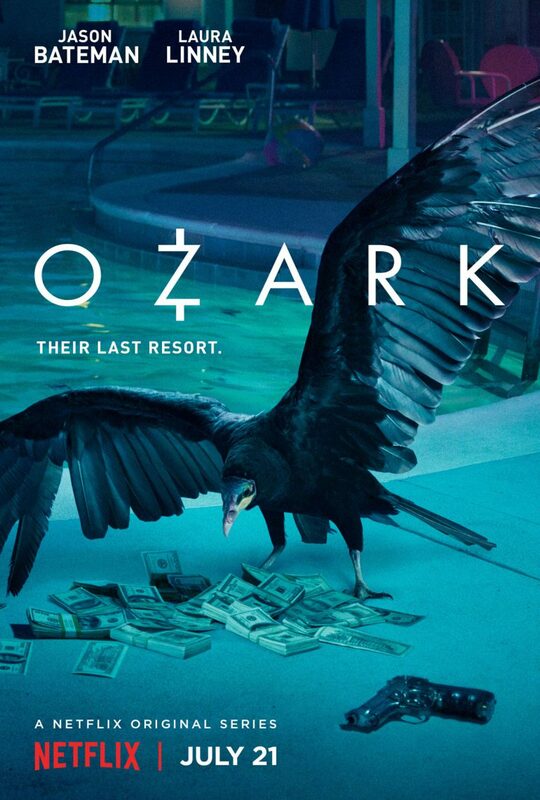 Del Pino chose Zeiss Super Speeds for night scenes and Hawk V anamorphics for day scenes on Ozark. He liked the claustrophobia of cropping the anamorphic images to 2:1, the show’s delivery ratio, while the Super Speeds produced a creaminess he found appealing. 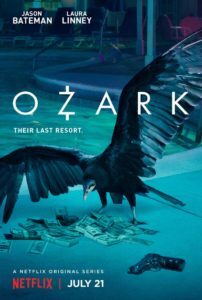 He also mentioned that the Varicam’s sensor handled greens very well, which was important for him, given how much of Ozark takes places in woods. 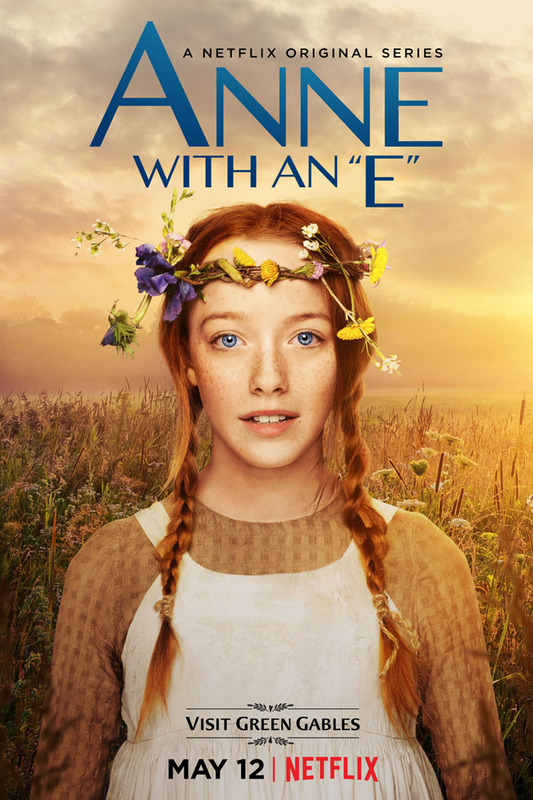 Anne with an E was lensed on vintage Panavision Standard and Super Speeds – “the oldest, craziest lenses we could find,” says Bobby Shore. He liked their low resolving power, their weird flares and how they fell apart when wide open. Part of the show’s signature look are ECUs of the freckled title character, which were captured on a 27mm Primo for a more detailed, tactile image. Inspired by the work of Robbie Ryan, BSC (Wuthering Heights), Shore kept the lighting naturalistic, mixing tungsten and HMI sources on a set that was treated like a location. He also shot through a Panaflasher, a special lens filter with built-in lighting which reduces contrast and adds a colour tint of your choice, but this effect was dialled out in post. Indeed, Shore raised the issue of DPs’ images being altered after the fact, an issue I explore fully in another Red Shark article. By the way, I’ve been watching Anne with an E since the festival and I can thoroughly recommend it. When the seminar was over, I went for dinner with Dave, Matt and Chris Bouchard, at a very nice (but once again cheap) Asian fusion restaurant. Then we met up for drinks with some of the reps from Red, and I got talking to a DP who had shot squid from a submarine for an episode of Blue Planet. After another drink or two with Chris at the Cheat bar, I called it a night. Tune in next week for the final part of my Camerimage blog. This week I attended Camerimage for the first time. Centred around the Opera Nova theatre beside the river Brda in Bydgoszcz, Poland, Camerimage is an international film festival celebrating the art of cinematography. It’s a bit like Cannes for DPs, but colder. This is the first part of my account of my three days at the annual hub of motion picture imaging. The Ryanair flight was dirt cheap but trouble free, and at 9:50am I found myself on the tarmac of Bydgoszcz airport. There I met David Shapton and Matt Gregory, founders of Red Shark News, for the first time. I’ve been contributing articles to Red Shark for a few months so it was nice to finally meet these gentlemen in person. A taxi (also dirt cheap) dropped me at the Opera Nova – only about three miles from the airport – where I picked up my pass and goodie bag. Bizarrely, said goodies included an Ikea catalogue. How did they know that us DPs love flat-pack furniture so much? From the Opera Nova I hurried to a college across the river, where the sports hall formed the venue for a Canon workshop run by Stephen Goldblatt, ASC, BSC, the man behind the lens for the likes of Lethal Weapon 2 and Batman Forever. The blurb for this workshop described Goldblatt as “a master of low light shooting”, and it was certainly pitch black when I walked in a few minutes late, and gingerly picked my way around to the far side of the hall to find a seat. On a purpose-built bedroom set, Goldblatt was recreating lighting from the Robert Redford / Jane Fonda romantic drama Our Souls at Night, shot on the Sony F55 and Canon C300 Mark II. To practical lamps on either side of the bed he added egg-crated tungsten soft-boxes to beef up each one. He simulated moonlight through an imagined off-camera window by placing a lace curtain in front of a blue-gelled lamp and blowing it gently with a fan. An additional egg-crated soft-box provided a low level of blue toplight. As he worked, Goldblatt revealed how he doesn’t miss ceulloid, loving how relatively easy it is now to light night exteriors or moving car scenes. “But just because you don’t need much light,” he cautioned, “it doesn’t mean you don’t want to control it.” Other developments coming down the pipe do not inspire him so much; he feels that high resolutions and HDR are unnecessary, pushed by marketing people rather than creatives. He placed great emphasis on the importance of the eyes. “A common failing of newer DPs is that they worry more about the set than the eyes,” he said, before explaining how he will often walk beside the handheld camera with a torch, providing eye-light. He also stressed the importance of eye-lines. Although in any one shot it’s not that important how wide or tight the eye-line is, or how high or low, across the two hours of a feature film the decisions have a cumulative effect. Goldblatt no longer uses a light meter. “Trust your eye, develop your eye,” he advised, adding that you must have a strong voice to remain in control of the images through postproduction. After grabbing lunch, I returned to the Opera Nova to browse the exhibition hall. This closely resembled a mini BSC Expo or Media Production Show, with all the major camera and lens manufacturers displaying their wares, along with several lighting companies. I had a play with some of the cameras, including the actual Alexa 65 used on Rogue One. Then I met up with Chris Bouchard, one of The Little Mermaid‘s two directors, who had arrived in Poland the previous day. 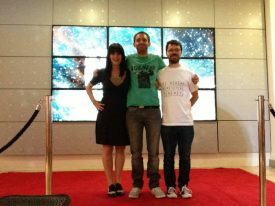 We sauntered over to another venue, the MCK Orzeł, an independent cinema with a nice, chilled, film-buff-friendly atmosphere. The auditorium itself was packed though as we settled in for a seminar on “The Future of Digital Formats”. Promoting Red’s Monstro sensor, the session was mostly about the benefits of shooting in high resolutions, and giving yourself the maximum flexibility in post. You can read my thoughts on both of those topics in upcoming Red Shark articles. Another interesting nugget came from Markus Förderer, BVK. 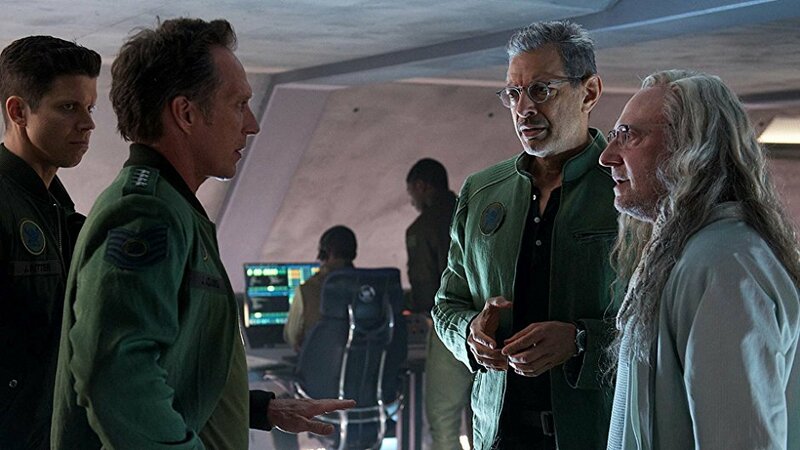 On Independence Day: Resurgence he switched between spherical, 1.3x anamorphic and 2x anamorphic lenses depending on the situation. For example, flatter lenses were better for wide shots – where anamorphics would distort straight lines – and for VFX work. 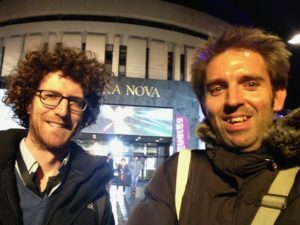 I ducked out of the Red session early so that I could pop back to the Opera Nova for the Hawk Vantage seminar, bumping into my Perplexed Music gaffer Sam Meyer on the way. Hawk were launching three new sets of lenses: MiniHawk (T1.7 hybrid anamorphics), Hawk Class-X (T2.2 2x anamorphics) and Hawk65 (T2.2). The MiniHawks in particular seem very exciting. Daniel Pearl, ASC showed us some stunning frame grabs from the upcoming Dennis Quaid vehicle Motivated Seller, shot using these lenses on Alexa Mini. 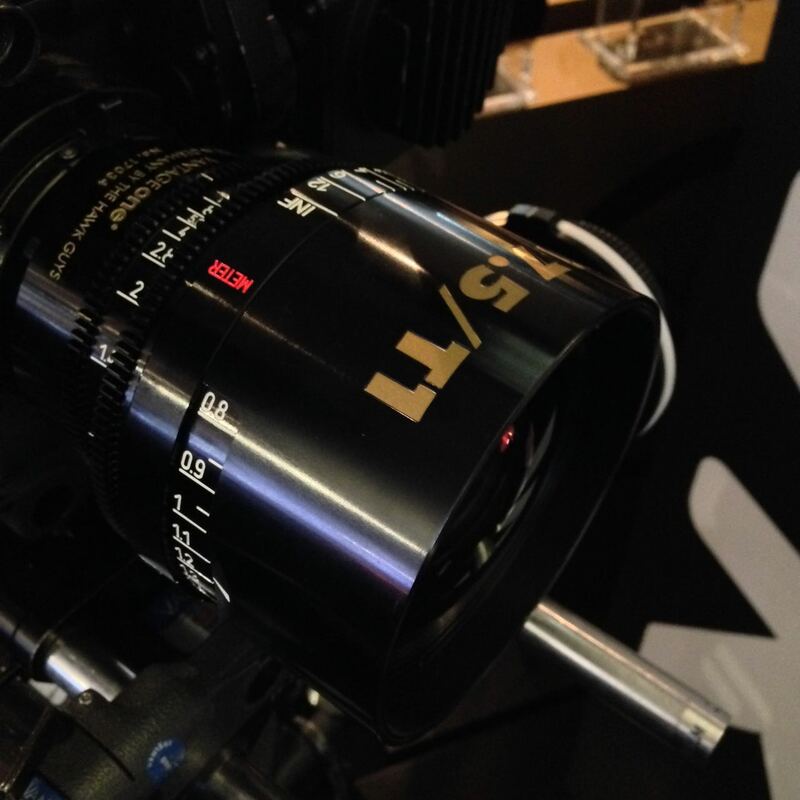 Whilst having key advantages of spherical lenses (speed, small size, low weight, extremely close focus) the MiniHawks have a unique and beautiful cigar-shaped bokeh. Stuart Dryburgh, ASC (The Secret Life of Walter Mitty, Bridget Jones’s Diary) talked about shooting 1.3x anamorphic. He has done this on three-perf 35mm (to achieve a Scope aspect ratio), on an Alexa in 16:9 mode (again for 2.39:1) and on an Alexa in 4:3 mode (to get 1.85:1). He also recommended shooting on Super-16 with 1.3x glass, citing the example of Ed Sheeran’s “Thinking Out Loud” video, which Pearl shot. I took my leave, dashing back to the MCK Orzeł for another lens-themed seminar, this time by CWSonderoptic, the makers of Leica. The first half of this panel revolved around a short film shot by Darius Khondji, ASC, AFC (Seven, Delicatessen) on an Alexa 65 with the new Leica Thalias. Campbell revealed that season three of Mr. Robot has a different look again, using much more camera movement and “twice as much atmos”. 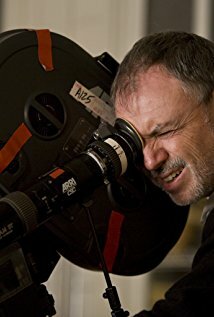 For this season he paired Canon K35 glass with an 8K camera, but due to the Canons’ low resolution he employed Leica Summiluxes for the wide shots. He also shared some interesting information about his testing process, admitting that he doesn’t really know how other DPs test. He doesn’t use charts, he just makes it up. He always includes a candle, a practical lamp, some kind of highlight in the background, and random foreground objects (as background bokeh can differ from foreground bokeh). When the Leica seminar ended I went back to the Opera Nova, where Chris and I had dinner at the nice (and once again cheap – are you detecting a theme?) restaurant. Despite having got up at 4am (3am local time) I wasn’t feeling too tired, so we headed upstairs to the 10pm seminar by Christopher Doyle, HKSC (Hero, Lady in the Water). Many people were nursing beers, including Doyle himself, and the lecture theatre was dimly illuminated by mood lighting. Clearly this session was not going to be like the daytime ones. There are only three people in filmmaking: the actor, the audience and the cinematographer in between them. If actors don’t feel loved, the performance will not come across on camera. Give the idea the image it deserves. [Vittorio] Storaro [legendary DP of Apocalypse Now amongst others] can’t tell you how to do it. You have to find it for yourself. People in space – that’s what cinematography’s about. The location is very important. It gives the energy, it imposes the style. The lens doesn’t matter; it’s what it shows that’s important. You never sleep because you care too much – that’s what filmmaking is. Doyle also picked up on a piece of dialogue from a clip he screened: “What is it?” / “I don’t know yet.” It was a great summation of finding the essence of a shot, he said. Having had our fill of aphorisms, Chris Bouchard and I slipped out to get a drink. The Cheat, the pop-up bar across the road, was absolutely packed, and my early morning was finally catching up with me, so I called it a night. The highstreet of Bydgoszcz was quiet and chilly as I walked briskly to my hotel, curiously located down a service road behind the city’s football stadium, reflecting on all that I had learnt that day. Tune in next week for tales from my second day at Camerimage. 2016 has not been the best of years, at least not according to the sinister algorithms that run my Facebook feed. The year has been kinder to me than it has been to seventies and eighties celebrities, however. Ren: The Girl with the Mark, the short-form fantasy action series I photographed in 2014 and spent parts of 2015 postproduction supervising on, met with great success in 2016. The series was released on YouTube in March, and episode one has to date had over 100,000 views, with overwhelmingly positive feedback. Alongside the series, I released Lensing Ren, a set of companion videos that broke down the lighting design and other cinematography choices in each episode. I thought it would be interesting to make frame grabs part of the lighting diagrams, so you can really see the effect of each lamp. It’s an idea that I’ve carried through to my Instagram feed, so if you’re the kind of person who often looks at a shot and wonders, “How was that lit?” then be sure to follow me and find out. We’ve lost track of how many awards nominations Ren: The Girl with the Mark has received at festivals this year, but the tally of wins stands at a dozen, including four Best Series and Grand Jury Awards. And although a trio of nominations for Best Cinematography didn’t yield me a win, Ren has already been selected for several 2017 festivals, so there will be plenty more chances! 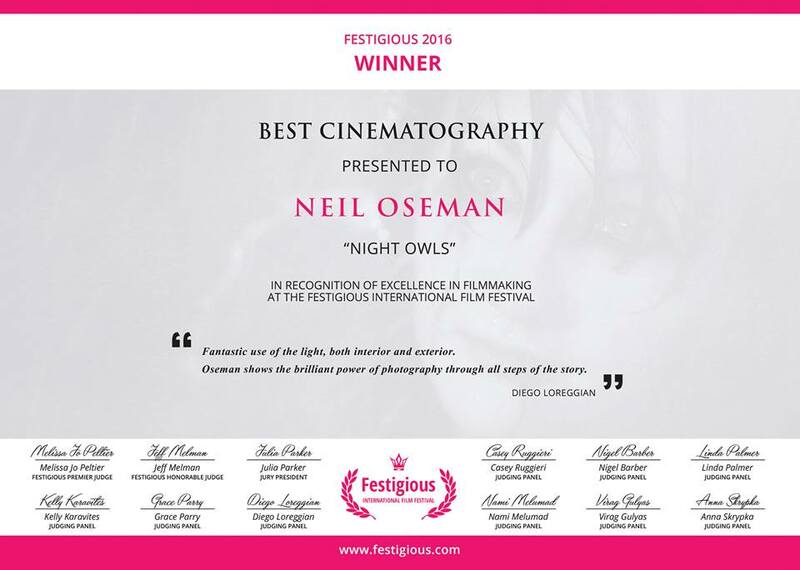 2016 did supply me with my first ever Best Cinematography award though, courtesy of the Festigious International Film Festival and Sophie Black’s short film Night Owls. This was one of three awards which Night Owls collected this year. And two other shorts I photographed have scooped awards during the year: race drama Exile Incessant, and supernatural drama Crossing Paths. Congratulations to everyone who helped make all these projects such a success. As regards new productions, my 2016 was dominated by two feature films: family fantasy The Little Mermaid, and comedy road movie Above the Clouds. You can already read my daily blogs about the latter film, and I hope to publish plenty of content about the cinematography of the former film when it’s released next year. The Little Mermaid was the perfect follow-up to last year’s Heretiks, going from my first six-figure-budget film to my first seven-figure-budget film. It also gave me the opportunity to light and shoot Oscar-winner and Hollywood royalty Shirley MacLaine, film in an incredible 1930s circus, go swimming with an Alexa, and gate-crash Baywatch‘s wrap party. There were tremendous challenges and lessons to be learnt along the way, and I came out stronger, far more experienced and eagerly anticipating the release of what should be a really magical family film. I also got to work on my first eight-figure-budget movie this summer, although I only did two days as pick-ups DP, recreating the lighting and camerawork of the extremely experienced cinematographer Javier Aguirresarobe, which was very instructional. Again, I hope to post a blog about that when The Etruscan Smile is released. Meanwhile I have continued, as ever, to both acquire and share knowledge of the craft of cinematography. For example, in September I attended Cinefest, Bristol’s International Festival of Cinematography, while the same month I published a series of posts covering all the main types of lighting unit currently available. I learnt quite a bit while researching those posts, and hopefully readers got a lot out of them too. And in that vein I’ll be releasing a new YouTube programme in January 2017. Lighting I Like is a 6 x 3 minutes series that aims to raise awareness of the contribution which cinematography makes to a film or TV show, while educating aspiring DPs about the hows and whys of lighting design. 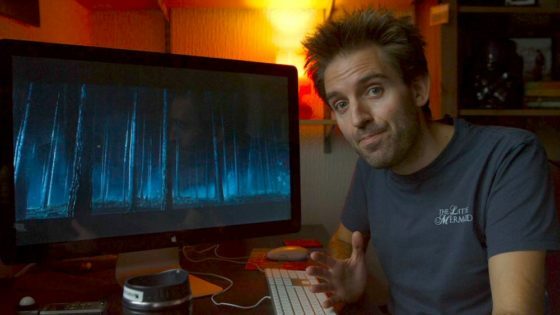 Each week I’ll look at a scene I’ve picked from a major movie or series, explaining what makes the lighting so good and how I think it was achieved. Simple as that! Lighting I Like will be released on Wednesdays starting January 4th, with the first episode discussing a scene from the Netflix series Daredevil. Be sure to subscribe to my YouTube channel so you don’t miss it. And with that I will sign off for 2016. Enjoy your new year celebrations, and I wish you all the very best in 2017. 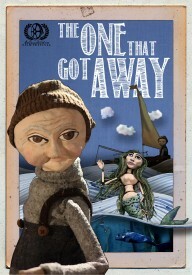 Last year I blogged about how one of my films, The One That Got Away, fared at film festivals. I promised to do the same with Stop/Eject…. well… better late than never! 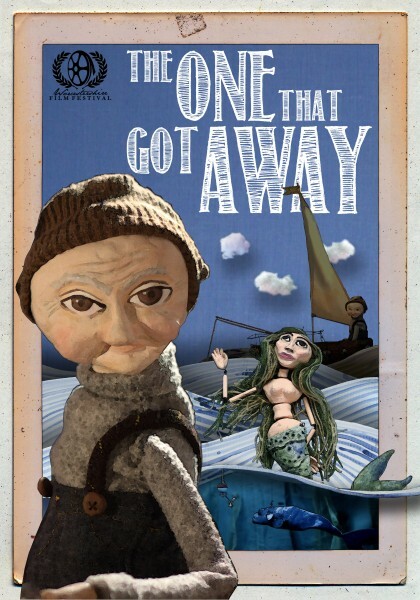 To recap The One That Got Away’s results, at a total cost of £71 I entered this three minute puppet film – which cost almost nothing to make – into 36 festivals, choosing mostly those with no entry fee, just middleman costs. It was accepted into just two. Stop/Eject was a bigger production, though still a DSLR short with an entirely unpaid cast and crew. It was financed by two crowd-funding campaigns, one in preproduction and one in post, which raised around £4,200. Although the second campaign’s budget included money towards festival entries, we later opted to run a third campaign from which we raised another £600 for additional submissions. I had decided early on that I wanted to go all-out for festivals with Stop/Eject, entering all the top tier ones and then a number of smaller events too. The British Council has a list of ‘key’ festivals (you can apply to the Council for travel funding if your film gets into one of them), and it’s also worth checking out the lists of Bafta- and Oscar-qualifying festivals. Over a two-year period, producer Sophie Black and I submitted Stop/Eject to 47 festivals, at a total cost of £772. Some submissions were direct, but most were via platforms like Withoutabox, Shortfilmdepot and Reelport. Wherever possible we sent online screeners, but some festivals only accepted physical DVDs or Blu-rays, so the £772 includes postage costs, but not duplication; see my breakdown of the film’s post budget for that info. With the exception of Aspen, we always entered before the Early Bird deadlines so as to pay the lowest fee and have the greatest chances of being programmed, because festivals do not wait until the final deadline to start filling up their screening slots. The most expensive entry was Berlin at £45 (€50), but at the other end of the scale a few festivals, like Torino, were free. Our first official selection, Raindance, came almost a year after we had started submitting. Full disclosure: our exec producer has worked for Raindance and put in a good word for us. Nonetheless, we were delighted and we hoped that screening at a top tier, Bafta-qualifying festival would bring us to the attention of festival programmers around the world and lead to at least a few invitations and further selections. But it was not to be. Another year of rejections followed, by which time we had run out of top tier festivals to enter and moved down to smaller ones which had piqued our interest for various reasons, or been recommended to us. We were eventually selected for six more festivals: Fargo Fantastic Film Festival, Southampton International Film Festival, the Underground Film Festival in Corke, the Short Cinema Festival in Leicester, Worcestershire Film Festival, and Beeston Film Festival. We were nominated for awards at three of these events, and ultimately won Best Drama Short at the Underground Film Festival. If you’re keen to know all the details, I’ve put together a spreadsheet of all the submissions we made, the costs of entry, middleman fees, and results. Download it here. Were those seven official selections worth the £772? Effectively we paid for seven screenings at £110 a pop. Or to look at it another way, we paid for seven laurels for our poster at £110 a pop. Many have posited that the whole film festival circuit is a con, that festivals have become gatekeepers in the way that studios and agents once were – check out this very interesting article. At the very least, I do think the odds of submitting cold to a top tier festival and getting in are astronomically low. One interesting little side effect was that, thanks to our Raindance selection, we were able to submit Stop/Eject for Bafta’s Short Film Award. We made the long-list for the award, meaning that we were one of fifteen films from which the five nominations were chosen. To be honest I’m a little relieved we didn’t get nominated, because then I might have felt obliged to use the exposure to push my directing career, rather than focusing on the cinematography career which I’m so much happier in now. Click here to view more Stop/Eject-related posts. To start with, here’s the film. It cost next to nothing to make, so I decided to enter it only into festivals that had no entry fee. I created accounts on the festival submission platforms Short Film Depot and Reel Port. Both sites have systems whereby you purchase credits (known on Short Film Depot as ‘reels’ and on Reel Port as ‘stamps’), which you can then use to pay for submissions. As far as I know, this payment is purely a middleman fee and doesn’t go to the festivals themselves. Both sites allow you to upload your film, which is then sent automatically with your submissions. Short Film Depot allows you to upload your first film for free, with subsequent uploads costing 3 reels (€3 – currently about £2.15). Each festival submission costs 2 reels(€2 – about £1.45). Reel Port is free to upload your film to. Each festival submission costs one stamp. Stamps are priced on a sliding scale: buy just one and it will cost you €3 (£2.15), whereas a book of 5 is €12.50 (£9), a book of 20 is €39 (£28) and a book of 50 is €75 (£54). So if you buy in big bulk, you could pay as little as £1.08 per submission, plus currency exchange fees. More likely, you’ll end up with leftover stamps you never use! I entered The One That Got Away into 36 festivals over the course of about 18 months: 23 entries on Reel Port, 12 on Short Film Depot, and one directly to the Worcestershire Film Festival (which was completely free). The total cost was €98.95, or about £71 plus currency exchange fees – that’s about twice the film’s budget! I should point out that I made one exception to the ‘no entry fee’ rule: that total cost includes €12.50 I spent on entering the film into Encounters. This was a discount rate because I was entering Stop/Eject at the same time. Why did I pay for Encounters? Because of their Depict Competition (which The One That Got Away didn’t actually qualify for, being over 90 seconds) they seemed to be associated with very short films, and with hand-made animation-type films. Plus I knew the festival director from doing FilmWorks. How many of those 36 festivals did the film get into? Two. 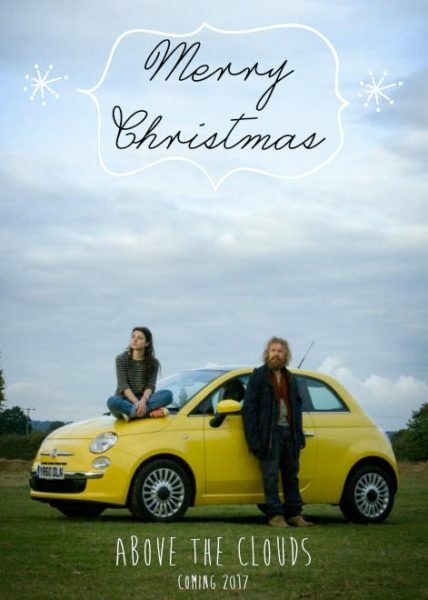 Worcestershire Film Festival, and Belo Horizonte International Short Film Festival in Brazil. Belo Horizonte’s notification email told me that The One That Got Away “was one of the 12 selected for the Children’s Exhibition, among 2,700 subscribers.” That gives you an idea of the kind of odds you’re up against with a festival submission. Suddenly 2 out of 36 doesn’t seem so bad. I have great admiration for what the guys at Worcestershire Film Festival are doing, and it was really great to go along and see the film with an audience, but at the moment it’s quite a new and low-key festival. For all I know, the same is true of Belo Horizonte, though I wasn’t about to fly to Brazil to find out. (They were not offering to pay my travel.) I’d estimate a total audience reach of about 100-150 people for those two screenings. Less, I would guess, than it’s had online. And apart from a little bit of buzz amongst my social media network generated by the announcement of these festival selections, there have been no other benefits. I leave you to decide for yourself whether you think it was worth all those entries and the cost of £71. A full list of festivals entered follows. Look out for my future post on Stop/Eject’s festival entries. Since that film was crowd-funded, we were able to take a very different approach and enter a lot of top tier festivals, so it will be an interesting comparison. Last summer I completed two short films as director, the 17-minute fantasy-drama Stop/Eject and the two-minute puppet fantasy The One That Got Away. After a year of entering them into festivals around the world without getting anywhere, I was beginning to give up hope of them ever getting selected. But I’m delighted to say that both have been recently accepted for festivals taking place this month. Stop/Eject will get its world premiere at Raindance Film Festival in London. Raindance is amongst the UK’s most prestigious festivals, counting amongst its previous premieres Memento and The Blair Witch Project. The One That Got Away will get its first overseas screening at Belo Horizonte International Short Film Festival in Brazil. The welcome news of these festival selections had me scrambling into the archives of this blog for the post I wrote last year on making a DCP (digital cinema package). Since the decline of film as an exhibition format, DCPs are the new standard for delivering movies to a cinema. I needed to transcode The One That Got Away’s 1080P ProRes 422 (HQ) master into a DCP. Belo Horizonte accept 25fps DCPs, so I skipped the frame rate conversion. I dropped the ProRes file into a new timeline in Final Cut Pro and set the sequence frame size to 1998×1080, the standard resolution for a non-Cinemascope 2K DCP. I then used the Motion tab to blow up the image slightly to fill the width of the frame, losing a little at the top and bottom of the image in the process. I used Final Cut Pro’s ‘Export using Quicktime conversion’ to export the ProRes file as two mono WAVs and an 8-bit TIFF sequence. (16-bit is preferable for DCPs, but the film had been edited in Final Cut 7, which only deals with 8-bit colour space.) I then followed OpenDCP‘s straightforward three-step interface to transcode to JPEG-2000, then MXF, then wrap it all up with the XML files. I didn’t need to worry about disc formatting, because the festival accepted an FTP upload of the files. Before uploading The One That Got Away’s DCP to the festival, I decided to test it at home as best as I could, so I downloaded a free trial of EasyDCP which let me check the first 15 seconds. The colours were screwed up, but that’s normal. Home computers can’t handle the XYZ colour space of DCPs. Stop/Eject’s DCP was created last year, as documented in the post mentioned above, Making a DCP. I purchased a 500GB Lacie Rugged USB hard drive to put it on, not knowing at the time how big the files would be. I now know that 2K DCPs at a reasonable quality are about 1GB per minute, so Stop/Eject’s is 17GB. A memory stick big enough to put that on would have been expensive last June, perhaps more expensive than the Lacie Rugged. But over a year later, a Corsair 32GB USB 3.0 stick is only £15.45 and there are even cheaper brands on the market too. Plus, of course, a stick is much easier to post to a festival than a hard drive, and far less likely to get damaged on the way. So I bought the Corsair stick and booted up my Mac in Ubuntu, as detailed in last year’s post. I formatted the stick as EXT-2 rather than 3, as Raindance’s documentation seemed to favour the former. I copied the files across from the Lacie Rugged. Then it was just a case of packaging it up and sending it off with back-up copies on DVD and Blu-ray, and a press kit for good measure. Incidentally, Stop/Eject’s DCP runs at 24fps for maximum compatibility, extending the running time of the film by about 45 seconds over the original 25fps version. I had wondered for some time if, when the film finally got into a festival, this longer running time would be an issue. After all, at nearly 17 minutes at 25fps, Stop/Eject is quite a long short already. I’m told that Raindance almost decided against selecting it because of its length. And the judging panel had been watching a 25fps screener. How would they feel about screening an even longer version? I contacted the festival, explaining the situation and offering to make a 25fps DCP if need be, but they were fine with it running at 24fps. Apparently they allow for runtime discrepancy when scheduling. Well, that all got very dry and technical, didn’t it? Hurray! My films got into festivals! 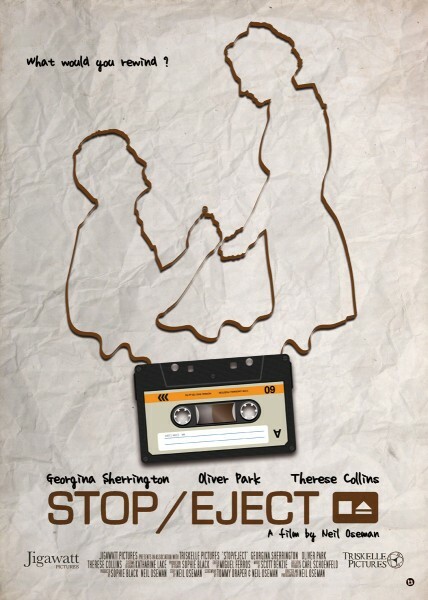 Since completing the magical and moving fantasy-drama Stop/Eject last year, a number of people have contacted me asking where they can see the film or how they can buy a copy. 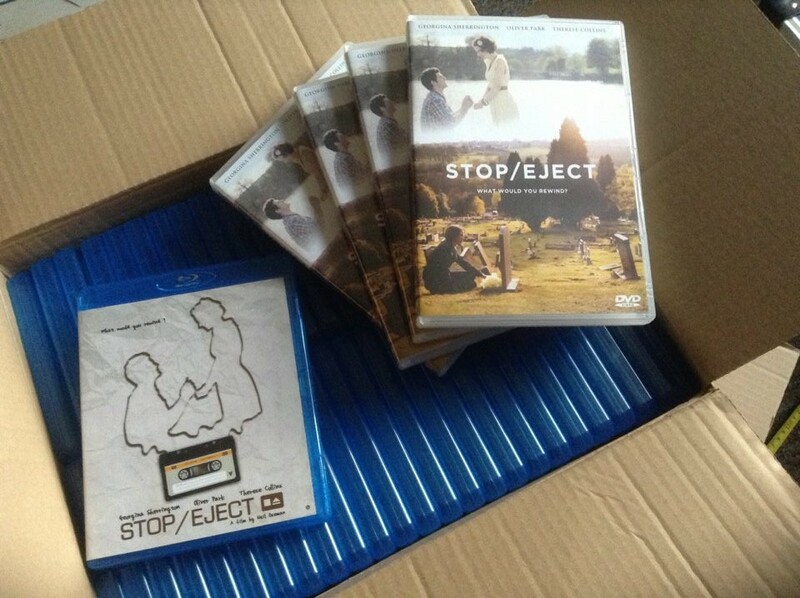 Great news – from this Sunday, for two weeks only, a limited number of DVD and Blu-ray copies of Stop/Eject will be available to buy. Both discs are loaded with extra features including a 30 minute behind-the-scenes documentary, cast and crew commentaries, and deleted scenes. You’ll also be able to “rent” the film for online streaming. To get your copy, just vist the official website at stopejectmovie.com from Sunday onwards. Hereford’s Borderlines Film Festival draws to a close for another year, and once again I’m going to temporarily turn film critic and say a few words about the screenings I caught. Spike Jonze’s latest film puts a sci-fi twist on the romantic genre to produce a love story in which one half of the couple exists only as a voiceover. 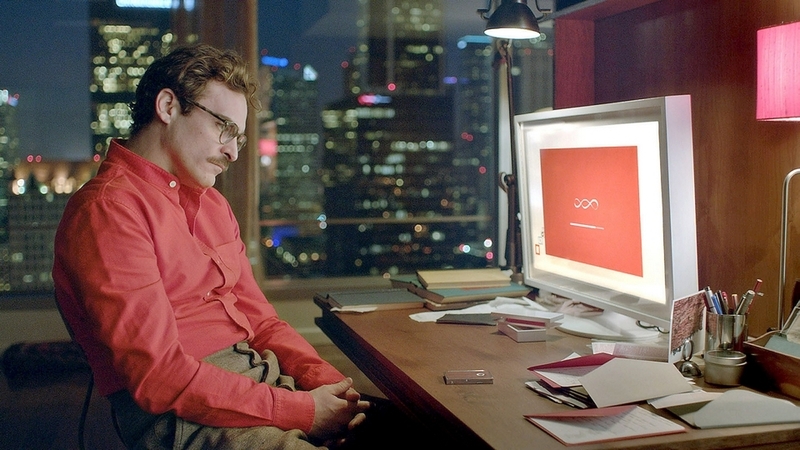 Joaquin Phoenix plays the improbably-named Theodore Twombly, a soon-to-be divorcé who falls in love with his artificially intelligent operating system, voiced by Scarlett Johansson. The big surprise here for me was the humour. Numerous comedy moments were derived from the application of relationship tropes to the unusual man-machine pairing. But in a near-future world which feels incredibly close to the present day, with our tablet and smart phone obsessions, our online dating, our social media – human relationships bridged (or barricaded?) at every turn by technology – the premise of Her felt entirely plausible, perhaps even inevitable. The film has emotional resonance too, played out as it is in intimate close-ups with very genuine performances. And I must tip my hat to costume designer Casey Storm who, faced with the classic sci-fi challenge of how to make futuristic fashion seem believable, decided perversely that in the future, young people would dress like the elderly do today, trousers halfway up to their armpits and all – brilliant! 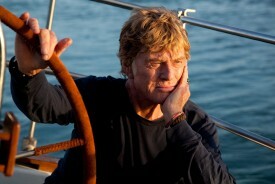 In this almost dialogue-free feature from director J.C. Chandor, Robert Redford plays a solo sailor who battles to survive after his small yacht is damaged in the Indian Ocean by a collision and a storm. 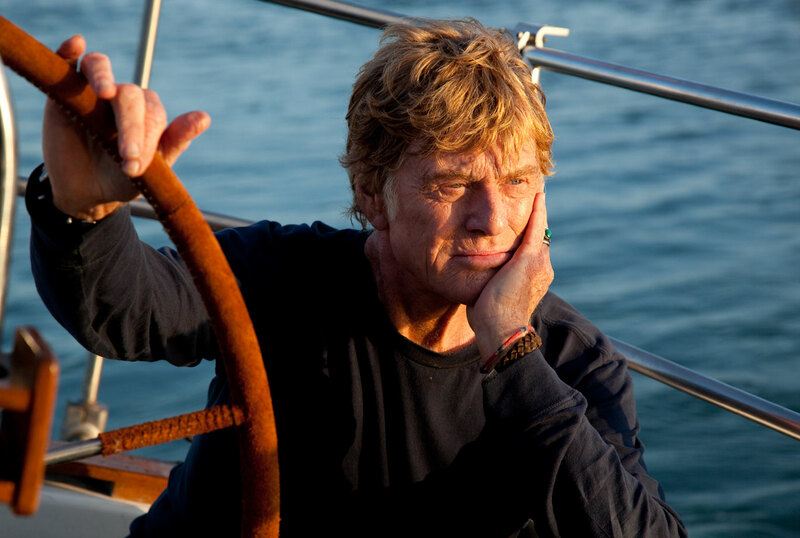 All is Lost has a lot in common with Alfonso Cuarón’s brilliant Gravity: both are extremely immersive tales of a single person alone against the elements (or lack thereof). At the end of both films you feel as if you have lived through those experiences yourself. And just as Gravity has been criticised by physicists and astronauts for alleged inaccuracies, so All is Lost was ripped to shreds in the post-screening Q&A by the many sailors in attendance, despite most of them apparently appreciating its entertainment value. Both films also tackled the big themes of life and death, both employing womb-like imagery in the process, Gravity’s with Sandra Bullock floating foetally in an airlock, and All is Lost’s with Redford curled up in the amniotic coccoon of his life raft. Where the films differ is in pace, however. Whereas Gravity was tense and action-packed throughout, All is Lost has more meditative sequences, during which I often found myself day-dreaming. But in a strange way, that made the experience all the more realistic, as the events continued to unfold in what felt like (but wasn’t at all) real time and I picked them up a little further on. So not a film I would watch over and over again, but definitely worth seeing once for the experience. If the characters from The Big Bang Theory made a film, this is the film they would make. Nothing could be nerdier than this eighties-set tale of the rivalries in a computer chess tournament, shot in 4:3 B&W on a genuine period video camera. As if to establish once and for all that there will be nothing slick about this film, an early tracking shot ends with the camera jolting as the dolly comes off the rails. The relationship with technology is a deliberately blurred one throughout the film, with the style crossing over into “found footage” territory at times, constantly reminding us of the clunky electronic medium we’re experiencing it through, while the narrative has computers displaying flashes of humanity – and vice versa. There is a vague story arc about one character rebelling against the nerdy restraint of it all, but the overall effect is of watching a time capsule, albeit a forged one. 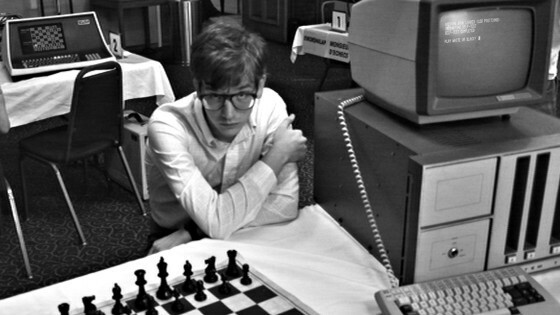 Computer Chess is an oddity, certainly, but one punctuated by some great comedic moments and saturated in nostalgia for those of us who once dabbled in the dark art of eight-bit programming. Ralph Fiennes directs himself and the up-and-coming Felicity Jones (Georgina Sherrington’s erstwhile Worst Witch co-star) in this biopic about Charles Dickens’ affair with young actress Nelly Ternan. Adapted from Claire Tomalin’s biography, the script is written by Abi Morgan, creator of the brilliant BBC 2 drama The Hour. Slow and subtle throughout much of its running time, The Invisible Woman holds the attention with a compelling performance from Jones, and beautifully understated cinematography. 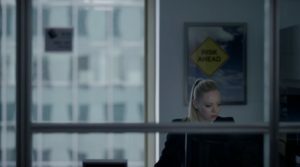 DP Rob Hardy consistently short-sides his subjects, giving the impression that they are all looking out towards something they can’t quite reach. Restraint is the keyword here, and while Fiennes has spoken of the conscious efforts he made to show that there were real flesh-and-blood people beneath the period’s restrictive costumes, the restrictions of society weigh heavily throughout. Just like much of Victorian literature, the film hints obliquely at scandal and impropriety without ever making it explicit. Unfortunately the result is that you come away from the film unsure as to why Dickens’ marriage wasn’t working, why he pushed his wife aside so cruelly, and what Ternan’s real feelings were for him; did she love him, or was she merely star-struck? The Invisible Woman is very watchable, then, but not satisfying. George Clooney directs, co-writes and stars in this faintly Dad’s Army-esque true story of a team of clapped-out soldiers tasked with recovering great works of art stolen by the Nazis. 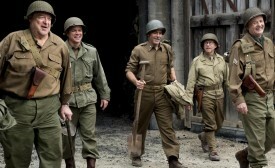 Matt Damon, Bill Murray, John Goodman, talented character actor Bob Balaban, Downton Abbey resident Hugh Bonneville and The Artist’s Jean Dujardin make up the rest of the team, aided by a resistance spy played by Cate Blanchett. 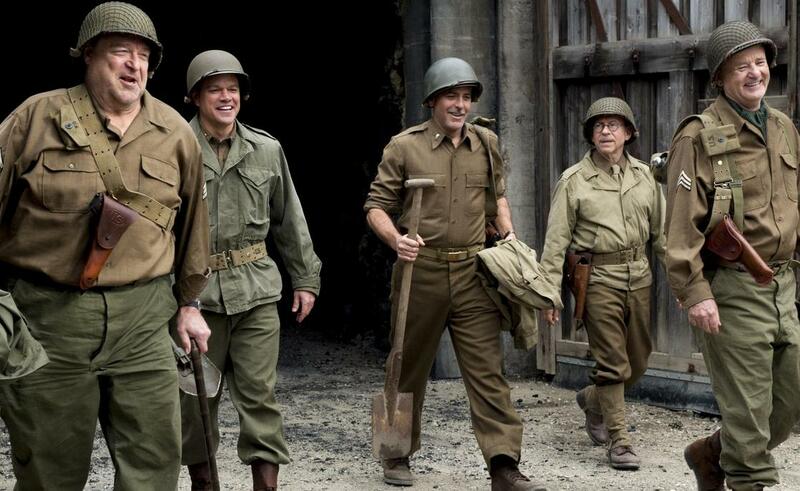 The challenge for Clooney was to make us care about the Monument Men’s mission to save paintings and statues, when men are dying every day for their countries. He achieves this by making us care for the characters – all curators and art historians – and thus share their love for art. Where many Hollywood scripts would have shoe-horned conflict into the team’s relationships, this film avoids such crassness, allowing the characters to all respect each other, but nonetheless banter humourously throughout. A joyous score by Alexandre Desplat is the icing on the cake of this amusing and uplifting film, which ended my Borderlines 2014 experience on a real high. Find out more about the Cannes film festival and market in these video blogs featuring me and fellow filmmaker Sophie Black.